Above: Monnow Bridge. Monmouth is to the right with the suburb of Overmonnow to the left. Monnow Bridge is the sole remaining mediaeval fortified river bridge in Britain where the gate tower stands actually on the bridge. The present stone bridge was erected late in the 1200s. During 1988-1990 the Monmouth Flood Alleviation Scheme was effected in order to protect Monmouth from occasional flooding by the Monnow River. Before works to strengthen the foundations of Monnow Bridge, boreholes and excavations were undertaken which revealed remains of the previous wooden bridge directly under the present stone one. These remnants were parts of oak trestles with sole plates supporting vertical timbers and bracing. Dendrochronological analysis suggested that the timbers had been felled between AD 1123 and 1169, giving a construction date of up to c.1180. The bridge stabilization plans were modified slightly to preserve the wooden remains in situ. 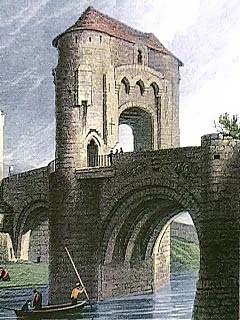 The gatehouse atop Monnow Bridge, Monnow Gate, was not an original feature of the bridge. It formed part of new town defences begun at the beginning of the 14th century. Henry of Lancaster, the King's nephew, petitioned Edward I to issue a murage grant in favour of Monmouth. The king assented. It is following this 1297 grant that the Monmouth authorities were able to gather the wherewithal to build the mediaeval town walls and gates. Evidently the project at Monmouth was incomplete by 1315, or repairs were needed, since the authority of 1297 was renewed on 1 June 1315. The Monnow Bridge and gate of circa 1300 were arguably very different from the present building. In those days the bridge was considerably narrower, and pedestrians and vehicles passed through the single arched passage of a tower probably whitewashed all over. 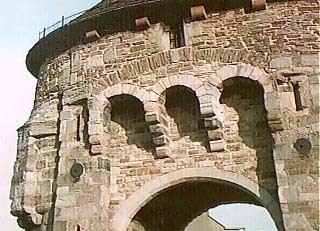 At first Monnow Gate was without the three machicolation arches (shown at right) that today form such a prominent part of its facade. 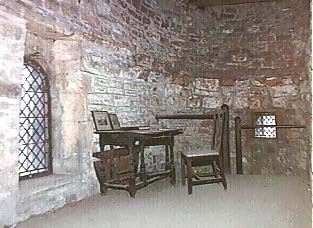 A portcullis hung in front of the main doors, whilst a wall-walk above was surrounded by a castellated parapet. Other than their defensive uses, Monnow Gate and the other town gates were used regularly over more than five hundred years as the sites of toll collections. Tolls were authorized in the patent rolls of 1297 and 1315, and, in subsequent Monmouth charters, tolls were allowed for various specific purposes. Below: Monnow Gate. The original (pre-1705) roof line ran just above the main window and is marked by corbels which once supported the roof timbers. Whether or not the war had any effect upon Monnow Gate, by the turn of the 18th century it was in need of maintenance and in 1705 Monmouth's Common Council 'ordered that the present chamblains of ye said Town do forth with cause Monnow Gate and the Gates thereof to be repaired and fitted up'. It is at this time that the Monnow Gate made a great leap towards the appearance of today. Rebuilding of the battlements as solid walls and raising the roof allowed the gate to be used as a house. A 1705 contract required the lessees to convert the gate to a house, but, beyond this remodelling of the tower itself, a two-floored extension was constructed which abutted the gate at its eastern corner. This lean-to extension, timber framed, with lath and plaster infill, projected out over the river, held aloft by a wooden beam and a stone pillar. Although the gate had been converted to a dwelling, some part of it, or the adjoining lean-to extension, must have been earmarked for use when required as a lock-up or guardroom. In 1768 James Powell Naylor took up a lease of the corporation house adjoining Monnow Gate as a dwelling for 10s. a year. However, the conditions required that he vacate the building whenever it was required as a militia guardroom. The first major structural change of the 19th century came when the century-old lean-to building was demolished in 1815. It is now difficult to imagine that the roadway at Monnow Bridge could have been so congested in 1819 that a separate pedestrian passage was necessary. However, in July 1819, an estimate was submitted to the corporation for creating a passageway where the old newel stair still stood. This quotes £3.10s. for taking down the old stair, cutting doorways through each side of the tower, erecting gothic arches, putting in two beams, walling up the old tower entrance, and making good the bridge parapet. Being several years before the bridge was widened on that upstream side, the new passageway was actually through part of the tower outside the bridge sides. A small platform was needed at each end so that pedestrians could reach the passage. In March 1845, instructions were given to prepare a new footpath at the other side of the bridge and an archway 'so as to pass through the Tower at an expense not exceeding Five Pounds'. Creation of this second pedestrian passageway was the last significant structural alteration effected on the bridge or gate. Since that year the structure has remained essentially unchanged, the subsequent works being primarily ones of maintenance and repair. A brass plaque attached to the front of Monnow Gate, along with the influence of the Somersets at Raglan, has led many to the erroneous conclusion that the Dukes of Beaufort had some ancient claim on the monument. However, Monnow Gate was directly associated with that family only from 1830 until 1900. In 1830 the duke accepted Monnow Gate in exchange for property which the corporation wanted at the Beaufort Arms yard. For the remainder of the century the gate continued mostly in disuse, or at the most in use as a storeroom. At the turn of this century, as some of the Beaufort estates were being sold, His Grace decided to present the gate to the County Council as they already owned the bridge. Since the turn of the 20th century the ever-increasing volume of motorized traffic led to parallel increases in collisions and obstructions at the gate. 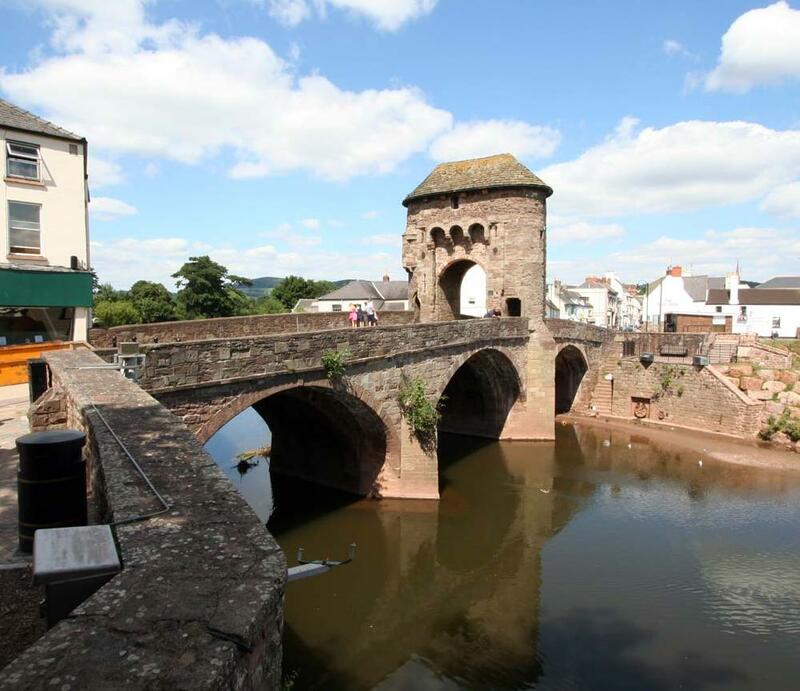 Plans to close Monnow Bridge to vehicles and to build a new bridge nearby were examined and postponed many times by the local government. At last, early in 2004 a new bridge was opened a few metres downstream of Monnow Bridge, and on the same day the old bridge became pedestrianized. Plans are being made to undertake a thorough conservation programme. Monnow Bridge and Gate, Stroud: Alan Sutton Publishing Ltd.